You can use 3D Maps to explore data with any type of map by creating or importing a custom map. 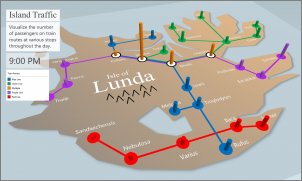 For example, you might want to create a custom map to show traffic for transportation routes, like the ones on this fictional island. A picture in .jpg, .bmp, or .png file format. For example, a picture of a floor plan or a public transit routes map. Data that relates to the picture that 3D Maps can plot on your custom map by using an XY coordinate system. Tip: If you don't have X and Y data yet, try using Microsoft Paint to record the pixel position of items in your picture and enter them in X and Y columns on your worksheet. In Excel, open the workbook that has the X and Y coordinates data for your image. 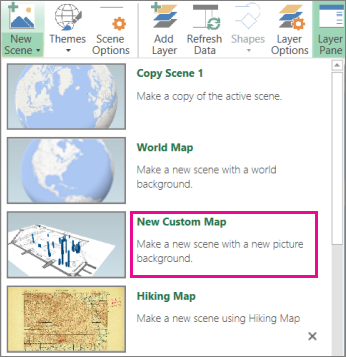 In 3D Maps, click Home > New Scene. 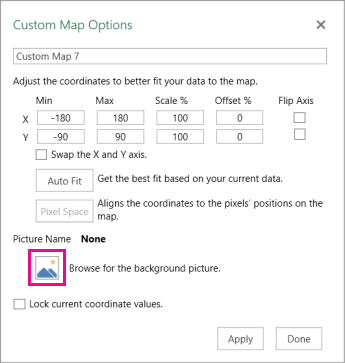 In the Custom Maps Options box, click Browse for the background picture , locate the picture you want to use, select it, and click Open. Adjust the X and Y coordinates as needed. Flip the axes by checking the Swap the X and Y axis box. Click AutoFit to get the best fit. Check the Lock current coordinate values box if you don't want the values to be changed. Click Apply to accept the selections you made, and click Next in the Layer Pane. You're now ready to use 3D Maps as you would with any other geographical data.